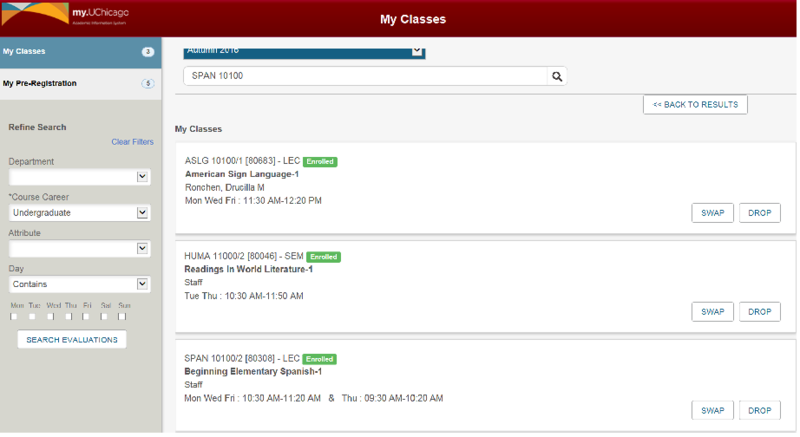 Using the class search function, you can search for classes using the filters on the left hand side of the page or the quick search to find a class. If the section has seats available, you will see a “Swap” and “Add” button. Click on the Swap button to initiate the registration request. Once you have clicked on the Swap button, a drop-down menu will appear prompting you to select the class that you wish to drop. You will select the appropriate class and lick on the Swap button below the drop-down menu. A pop-up message will appear asking that you confirm the swap request. If the transaction is successful, My Classes will automatically update and a confirmation message will appear at the top of the page. If the swap is unsuccessful, no change will be made to your current enrollment.